The adventure motorcycle segment has seen a big boom over the last couple of years and every manufacturer worth its salt is gearing up to cater to the demand of these motorcycles. While satiating the need for speed and adventure, the big reason that adventure motorcycles sell in large numbers is because they are quite practical in our conditions. The sheer number of Triumph Tigers that dot our roads is proof of that and it's no secret that Triumph made a killing by recognizing the need for adventure tourers. 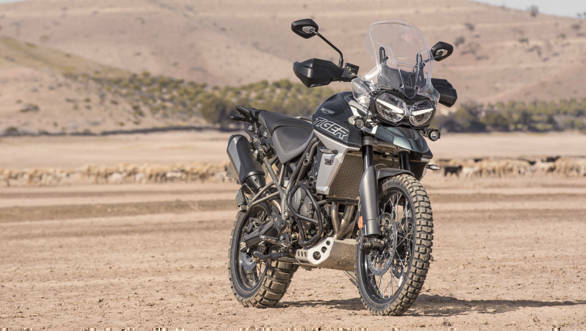 Now, in 2018, they are set to launch the new Tiger 800 and our experience from the first ride in Morocco tells us that the new Tiger 800 is far improved iteration of the previous motorcycle. BMW India has sensed the demand for such motorcycles and it dropped a bomb at the Auto Expo 2018 by launching the F750 GS and F850 GS at Rs 12.2 lakh and Rs 13.75 lakh respectively. For a CBU import, the bikes priced pretty competitively and bang in Tiger territory. In fact, the recent drop in CBU import duties to 50 per cent may result in a further drop in the BMWs prices. While the Tiger is yet to be launched India, which is most likely to happen in the next couple of months, we expect it to be priced in the vicinity of the BMWs prices. 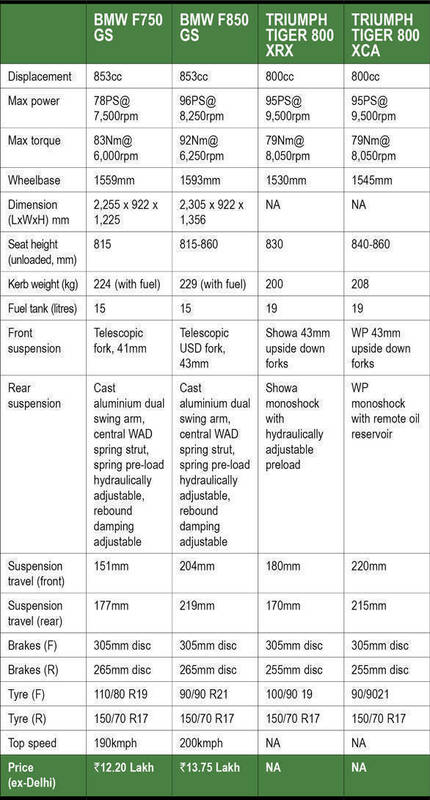 Here's a detailed spec comparison to give you an idea of how the bikes stack up against each other. The 2018 Tiger is not an entirely new model. Think of it as a substantial upgrade to the existing Tiger 800 range, featuring a slightly tweaked design, a new visor with inbuilt wind deflectors to reduce rider fatigue and a suite of electronics. The body panels are new, however, the tank is exactly same as the before. The new Tiger also gets LED DRLs and LED headlamps and on the whole the new Tiger looks sharp and aggressive. 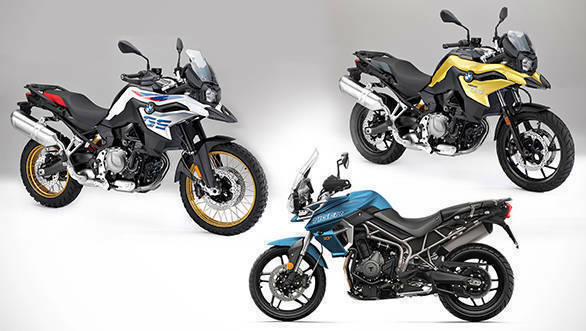 The BMW F750 GS and BMW F850 GS look a little slender and compact in comparison to the new Tiger 800 range. The BMWs borrow a few design cues from the bigger GS' but at the same time manage to carve out an identity of their own. The F 850 GS is also available in a special, Rallye colour scheme which looks fetching, especially with the gold coloured rims. Between the two BMWs the F 750 GS is the road biased motorcycle that will take on the Tiger 800 XR range while the F850 GS, with its longer travel suspension and wire-spoked wheels has the Tiger 800 XC range in its cross hairs. BMW had showcased the bikes at the 2017 EICMA in Milan, Italy where OVERDRIVE had received exclusive confirmation that BMW would bring the F750 GS and F850 GS to India in 2018. 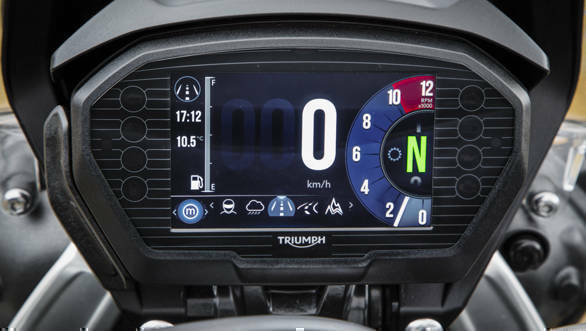 Among the list of upgrades to the new Tiger is the all-new, backlit switchgear and a 5-inch, tilt-adjustable, colour TFT instrument cluster. There are up to six riding modes and the XC range also get an Off-road Pro mode that switches off the ABS at the rear wheel and backs off the traction control to let you slide the bike on dirt. The top models also get heated grips as well as heated rider and pillion seats. 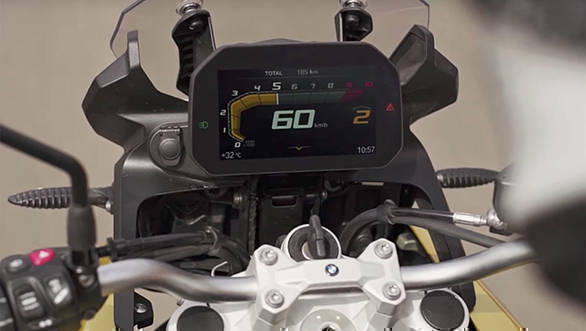 The BMW F750 GS and F850GS get full LED headlights, an LCD display with an analogue tachometre. And special SOS button on the handlebar that can send out a distress message, along with the location to emergency response teams such as an ambulance, in the event that a rider falls off the bike and is injured. The options list includes a connected ride system that replaces the standard instrument panel with a 6.5-inch TFT display that also shows navigation directions, make calls or listen to music via a smartphone. The 2018 Triumph Tiger 800's liquid-cooled, inline-triple engine features over 200 changes that have resulted in a much smoother engine that's also quicker to rev. The engine produces 95PS (at 9,500rpm) and 79Nm at 8,050rpm. The gearing for the Tiger XC range has been tweaked slightly to improve torque delivery at low speeds. The BMW F750 GS and F850 GS have the same 853cc, liquid-cooled parallel twin motor, albeit in a different state of tune. The F750's engine makes 78PS at 7,000rpm while the F850's engine makes 96PS at a relatively higher 8,250rpm. The former's motor churns out 83Nm at 6,000rpm and while the 850's motor produces 9Nm more at 6,250rpm. The BMWs motor clearly produces a lot more torque and that too at a lower rpm than the Tiger's engine. The BMW F750 GS uses a conventional, 41mm telescopic fork (151mm travel) and an adjustable monoshock with 177mm travel. BMW says that though the F750 GS is a road biased bike, it can handle light off-roading. Its direct rival, the Triumph Tiger XR has longer travel (180mm), USD forks by Showa with 43mm inner tubes. The adjustable, Showa monoshock at the rear, however has comparatively lesser travel at 170mm. Both bikes have 19-inch front and 17-inch rear wheels. 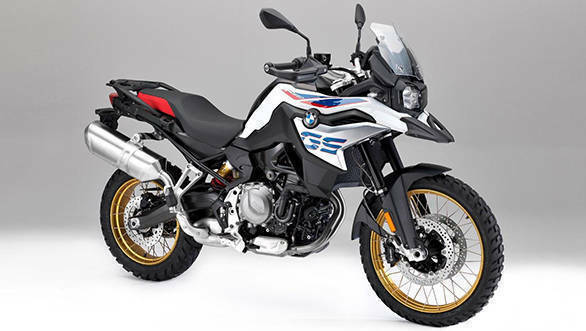 The BMW F850 GS' off-road focus is evident in its long travel suspension and tubeless, wire-spoke wheels. The 43mm USDs at the front have 204mm travel while the adjustable monoshock has 219mm travel. In comparison, the Tiger 800 XCA has a whopping, 220mm travel on the 43mm front forks by WP. The WP rear monoshock has slightly lesser travel than the BMW, by 4mm. Both motorcyles run on 21-inch front wheel and 17-inch rear. The tyre sizes too are the same. The specs do suggest that both bikes will be pretty capable off-road but the proof of the pudding will be in the eating, so we shall wait to decide which bike is better in a detailed comparison test. For now, the spec table below should give you a fair idea of how these motocycles stack up against each other.